I have ordered it yesterday for Rs.17756 (Indian currency) as there was a diwali offer,now waiting desperatly to get it delevired. Dutta, 07 Nov 2012I wanna buy this..but can anyone tell me does Skype work properly in Samsung Galaxy Tab 2 7.0 ... moreMan, its just below the "POST YOUR OPINION" button. Dutta, 07 Nov 2012I wanna buy this..but can anyone tell me does Skype work properly in Samsung Galaxy Tab 2 7.0 ... moreyes skype works great. Dutta, 07 Nov 2012I wanna buy this..but can anyone tell me does Skype work properly in Samsung Galaxy Tab 2 7.0 ... moreSeriously, is it so hard just to type "SKYPE" in the "Search Bar in the "Opinions" than to just post one opinion asking the same question, answered a MILLION Times. The Only questions am finding on this Opinions are, Does the battery work, is SKYPE WORKING, BLA BLA BLA does it supports calls. ITS ALREADY ANSWERED THOUSANDS OF TIMES. And search for it in the Box provided just above this post. I wanna buy this..but can anyone tell me does Skype work properly in Samsung Galaxy Tab 2 7.0 P3100 ? Kindly reply .. 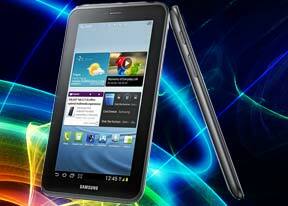 It's still difficult to find a customers friendly price, whole rounder tablet-phone like this in the markets. One of the best xxxl smartphone, I should say. finally decided dat m gonna buy this one! Am ready to go till 20 K so is it good option to go for this phone or can anyone suggest a good tab. Anonymous, 06 Nov 2012Polaris office. Not perfect but good enough for on-the-go editing. KingSoft Office too works fine on this tablet. Raaz, 01 Nov 2012Excellent tab. Just upgraded to android jelly bean. you can get the latest firmware at sam mob... morepls how do u upgrade n where can i do my own up,grading thanks. Mathi, 05 Nov 2012it's have document editor(ms-office)?Polaris office. Not perfect but good enough for on-the-go editing. supporting almost all the current mobile HD Games. Anonymous, 02 Nov 2012 2g data speed is not suitable (buffering issue) for watching videos,live TV or movies direc... moreThanks for the response. can i play facebook games with this tab? this is one of the simplest tab. very easy to handle and very easy to use. I have tab 10.1 and tab 2 7"